Asheville - Douglas Jon Cotts, 65, passed away Saturday, November 21, 2009. A native of New York City, he was the son of the late Minor and Caroline Cotts. Doug held a B.A. from Manhattan College. Doug was a Database Architect with AXA Equitable. Doug was a member of the U. U. Church of Asheville. He enjoyed steam train excursions, collected Lionel trains and train paper. As an accomplished amateur photographer his work was often exhibited. He supported the Symphony, the Civic Opera, the Choral Society, and the Chamber Music Series. Surviving are his wife of 32 years, Elinor; stepson, Eric Westenburg; step-daughter, Kirsten Barnhorst and husband, Donald Jr.; brother, Daniel Cotts; and grandchildren, Lauren, Margaret, Thomas and Matthew Barnhorst, and Decker and Ashton Westenburg. A memorial service will be held at 3 p.m. Saturday, Nov. 28, at U.U.C.A. In lieu of flowers, memorials may be made to the John F. Keever Solace Center, P.O. Box 25338, Asheville, NC 28813. Douglas Jon Cotts was born on 1/15/44 in Nassau county NY, city of Mineola. He died on 11/21/09 in Buncombe County NC, city of Asheville. His ashes will eventually be put in the ground in Hardin County, IA city of Iowa Falls. We are waiting until much warmer weather in Iowa to eventually put him in the ground. Doug was in the US Army from 1/10/68 to 12/24/69. He was given an honorable discharge with rank of SP5 and received the following Medals: NATIONAL DEFENSE SERVICE METAL, VIETNAM SERVICE MEDAL, VIETNAM CAMPAIGN MEDAL AND GOOD CONDUCT MEDAL. 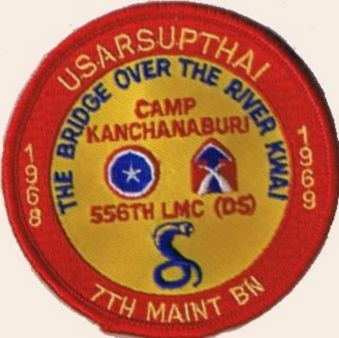 4 Apr 2005  USARSUPTHAI Group  Re: Letters from Home July 20 & 28 1969 Thanks to Terry W. Colvin for publishing excerpts from his letters home from Thailand. I also have the letters I sent home thanks to 1) my mother saved them, 2) she lived a long life to age 94, and 3) she lived in the same house for over 60 years so saved items remained saved. For what it's worth, here are some excerpts from two letters written in July of 1969. While plans are subject to change as things go along, I hope to use Bangkok as a base to take side trips. One day I hope to take the train out to Nakhon Pathom to visit and photograph the huge chedi there. It is the largest and reputed to be the oldest in Thailand. Another day I plan to take the train up to Ayutthaya, see some of the outlying sites not seen on my other two visits there, stay overnight, and catch the train up to Lopburi to see the sights there before returning to Bangkok. In Bangkok itself, I'd like to walk around and photograph the very interesting area around the Royal Palace. May also drop in at the Bangkok Riding and Polo Club. While it is private, I may try it anyhow. I sorely miss riding. This proposed schedule is too tight that probably I wont get to do everything but may as well try to get in as much as possible. Here we are all interested in and following Apollo 11. I hope the landing, exploration, and return are as successful as the first stages of the mission. Here we have live radio and TV coverage of the events. This accomplishment of communications seems to rival the moon mission itself. tips arose which may aid me in my work. I also have a programming project to do which will provide at least a week or two of work. It will be a very complicated job. Over here, we are all very happy over the success of the Apollo 11 mission. It was front page news all the way. It really got people (both Thai and American) very excited and interested. American prestige received a tremendous boost  and Nixon is really playing on it. Thailand is really going all out to welcome him. A tremendous amount of decorations were erected in Bangkok. My R&R was delayed a bit, voluntarily, by Apollo 11. The actual landing was about 3:15 AM our time and I stayed up to hear the live radio broadcasts of the landing. Of course, I overslept the next morning and awoke about when the moon walk started. So I watched parts of that on live TV. While the picture wasnt too clear, I suspect what we saw was probably about the same quality everyone else in the world got of the event. Even the house girls were watching. It was so hard to fully comprehend what was taking place. I wonder how much those simple young girls comprehended of it. All of this delayed my departure till afternoon when I grabbed the train down to Bangkok. Tuesday and Wednesday were spent walking around selected areas of Bangkok taking pictures. I took shots at the zoo, of the fountains at the corners of the palace grounds, of children swimming in a canal, of produce barges in another canal, and around the Marble Temple. At the latter place, ceremonies were going on accepting young men into the Buddhist monkhood. It is the ideal that every man spent at least a couple of months as a monk. This seems to be the traditional time, between planting and harvest, to accomplish this ideal. I took pictures of the processions around the temple and was even invited in to observe and photograph one of the ceremonies. Due to the poor light, I dont hold too much hope for those pictures  but maybe something will come out. That was one of the nicest gestures of friendship ever extended to me here in Thailand. I had never met those people before. With the exception of a few types who try to make a fast buck off the foreigner, the Thais have been a very helpful and friendly people. Thursday I took the train out to Nakhon Pathom to photograph the huge chedi there. On Friday, I traveled up to Ayutthaya to photograph the rest of the sights not visited on my two previous trips and to revisit a couple of always photogenic spots previously seen. During those trips, I tried to get more human interest shots than previously and probably succeeded. If things come out, there should be some really good pictures of this trip. On Saturday, out of time, out of film, and out of money, I returned to Korat. I squeezed one purchase out of the budget. I bought one of those two bronze horses Ive been dickering on since April. Next trip, Ill have to get the other if still available. So thats it from here. "You may well remember the famous White Lake bear stories (a camping ground in New Hampshire where stories of bear sightings were generally regarded as 'tall tales'). Here, we have bear stories also but they are not tall tales. One unit down the street has a full grown Honey Bear as a mascot. The bear has been getting out of its cage quite a bit lately, almost daily the past few days, and then heading for our barracks. It can open doors either by standing up and leaning on the door or by hooking its claws around the edge and pulling the door open. Needless to say, it doesn't help morale to have a bear meandering around outside or walking down the center aisle. The other morning it got in and ate one of the house girl's lunches. international conflict in which the burden of the war fell mainly on civilians. The United States first sent military advisers to South Vietnam in the 1950s. After a report in 1964 that the North Vietnamese had attacked U.S. vessels in the Gulf of Tonkin, Congress had authorized President Lyndon Johnson to increase U.S. military involvement. The Johnson administration authorized the bombing of North Vietnam, and the first U.S. combat troops arrived in South Vietnam in 1965. By 1968 there were more than 500,000 U.S. troops there. Antiwar sentiment developed at home, and demonstrations against the war became a daily occurrence, particularly on university campuses. The Nixon Doctrine was announced while he was on a tour which happened to coincide with the successful conclusion of the Apollo 11 moon landing. Nixon was both meeting with foreign leaders and accepting the worlds congratulations over our technological triumph. I have previously posted excerpts from a couple of letters home that referenced Apollo 11 and the anticipated Nixon visit. The following is from a candid letter home dated September 2, 1969 (not all of you are going to agree with some of my thoughts but thats the way I saw it), The talks which are soon to begin concerning U.S. troop reductions shouldnt have any effect on me. Perhaps I should describe the situation here more fully. There are approximately 48,000 American military personnel in Thailand of whom 75% or more are Air Force. They are here in direct support of the Vietnam war, flying bombing missions over Vietnam & Laos. Although I personally would like to see a quick American withdrawal from the Vietnam mess, that is not going to happen that quickly. The South Vietnamese hopefully will be able to take over more and more of the ground fighting. But baring a quick peace settlement, which appears most unlikely, they will continue to need American air support for a long time. I hope that this provides some historical context to the events we all participated in. Based on letters home it appears that the PERMACAP system became operational in Thailand on or about 1 November 1969. I suspect that it is highly unlikely that we will find UICs in orders earlier than this date. According to orders that I saved, the UIC for the 256th Personnel Service Company was WDFL6AAA. Here is a memory dump of what I recall: PERMACAP (Personnel Management  Card Processor) was the lowest tier of a 3-tier computer system for managing Army personnel. It was based on the UNIVAC 1005 Card Processor. Transactions from the PERMACAP tier were forwarded to the second tier which, for us, was located in Guam. That tier was based on the RCA 301/501 computer. That tier in turn forwarded transactions up to the top tier which was located in Washington, DC. That tier was based on the IBM 7080 computer. PERMACAP was based on punched cards, the old 80 column IBM card. There was a master file of all Army personnel in Thailand. That file contained 3 cards for each individual. There was also a Unit Header file used to print unit names on reports. That file contained 1 card for each unit. The UNIVAC 1005 was a small computer with 4,000 positions of memory. The main unit contained a card reader (600 cards per minute), a paper tape reader and the printer. There was an auxiliary card reader (400 cards per minute with 3 stacker select) and a card punch (2 stacker select) attached by cables under the raised floor. An IBM 093 Card Sorter and an IBM 088 Collator were also used in PERMACAP processing. The IBM equipment was maintained by Army personnel. The UNIVAC equipment was maintained by civilian engineers who had responsibility for all UNIVAC equipment in Korat. The Air Force had a UNIVAC 1050 and, if memory serves, the Army communications guys had a UNIVAC 1004 (same as a 1005 except that it was programmed via hard wired panels instead of via stored programs). punched paper tape. Later the punched paper tapes were read on the UNIVAC 1005 and the data was punched onto IBM cards. These cards were the transactions used in the nightly update cycle. The PERMACAP programs were provided to us. We just ran them as-is. We also had 3 or more programmers who handled local needs. We coded in SAAL  Single Address Assembly Language. I picked up the programming of the 1005 OJT. One of my first programs produced a 100 Day Shortimers Calendar based on one's DEROS. In letters home, I mentioned programs we wrote that produced reports probably used to help determine who went home and who stayed when troop reductions were ordered. I also wrote some programs on the sly for one of the NCOs who was secretary of the bowling league to help him keep the league statistics. also lists about 25 R&R hotels if anybody is interested. Like Wayne, I never set foot in Vietnam. I flew over the place going to and coming home from Thailand. However, my pay stub (DA Form 2139) shows CZE on line 40, Income Tax Withheld, for the month I arrived in Thailand. For the month I returned home, it has CZ in line 9, No. of Tax Exemptions, and a line through line 40, Income Tax Withheld. It doesn't look like this is proof of "boots on the ground" but if you can get them to accept it and give you the benefits you deserve, go for it! There have been several postings of recollections of Christmas in Thailand. I didnt spend a Christmas in Thailand but I have holiday memories connected with my service there. I left for Thailand on a charter flight out of Oakland International Airport, departing December 31, 1968 with intermediate stops at Honolulu and at Clark AFB, the Philippines. Due to the International Date Line, we changed from Dec. 31, 1968 to Jan. 1, 1969 somewhere over the Pacific Ocean in broad daylight. No New Years Eve for us. Not even a can of 3.2 beer on the aircraft with which to celebrate. As the hours passed, we tried to imagine what our friends were doing back home as midnight arrived in each time zone in the States. It was evening of Jan. 1st when we arrived at Don Muong Airport, Bangkok. So 1969 was the year without a New Years. working that flight were older women who had volunteered to work that day so that the younger women could spend Christmas with their families. I appreciated their thoughtfulness! And so I arrived late on Christmas Day, exhausted from lack of sleep, but happy to be home. 24 Dec 2008 - Re: [USARSUPTHAI] USO Story. Here is my USO story. Its not about Bob Hope or any of the entertainers. Its more personal. Forty years ago this week I was on leave in New York City before flying out to Oakland for transit to Thailand. I had a female friend who came from a divorced family. She had lost touch with her father six years before and felt that he had rejected her. This feeling of rejection made it difficult for her to form mature relationships. She invited me to a family Christmas party the day before Christmas. While there she asked me to try to locate her father. His last known address was in San Francisco and I was heading out there. I knew that there was nothing more important to her and so I said that I would try. Remember, this was forty years ago. We didnt have the internet or any of the online search tools that we take for granted today. If you lost touch with somebody and there wasnt anyone you knew in common who might provide a link, you probably had to hire a private detective to make a search. I flew into San Francisco the day after Christmas, giving me one partial day before having to report in to Oakland. I went to the USO in downtown San Francisco and looked through all the Bay Area telephone books. I found one name that matched, went back to the modest hotel where I was spending the night, and made a very carefully worded telephone call. It was her father. He hadnt rejected her. He had made some poor business decisions, lost his house, everything, and had been too embarrassed to tell his daughter. By the time he had regained his footing, she and her mother had moved and so contact was lost. He drove in to San Francisco, picked me up, brought me to his home where I met his family and was treated like royalty. Then he made a call to his daughter, re-establishing the contact that had been broken. This would not have happened unless the USO was there, in downtown San Francisco, and had all the phone directories. I always remain grateful to the USO for being there and I make at least one donation to them each year so that they can be there for todays service personnel. Thanks a million! !